There is a great need for more information on the progression of vision loss caused by inherited eye diseases and age-related macular degeneration. The Retina Foundation of the Southwest is beginning a new project aimed at developing sophisticated technology to help manage individuals with eye disease. 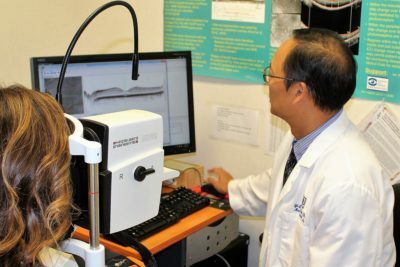 Scientists in the Retina Foundation have collected a decade’s worth of optical coherence tomography (OCT) images on our patients’ retina, the thin layer of tissue that lines the back of the eye on the inside. There are hundreds of thousands of these OCT images that will be imported into a new deep machine learning program. This machine learning program will then be trained to interpret OCT images. This advanced technology, the trained deep machine learning model, will not only be able to automatically, accurately, and time-cost effectively detect retinal defects, it will also allow us to study the relationship between retinal structure changes and the changes in vision. It will eventually be able to, once sufficiently trained, predict future changes of the disease conditions. Our main goal with this project is to help people who have been diagnosed with an inherited eye disease or age-related macular degeneration. This project will dramatically improve the way scientists and doctors are able to study the structure and function of the retina and how the function of the retina changes over time. This project will save countless hours and bring us closer to finding treatments for diseases like retinitis pigmentosa and age-related macular degeneration.